Big Data is big news, but what does it mean for you? With Microsoft, anyone can use Big Data to inspire innovation, accelerate decision making, and learn from and share insights—no supercomputers or PhDs required. 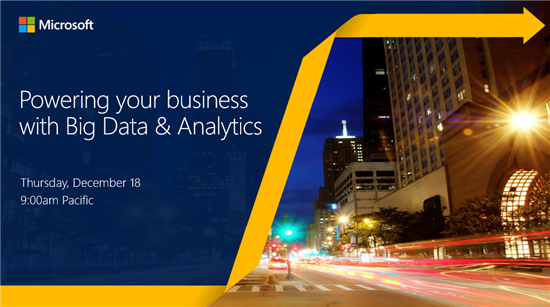 Join us for this hour-long Big Data & Business Analytics webinar where we’ll discuss how to gain real business advantage with data across marketing, finance, sales, HR, and more. Get the insights you need to compete—to innovate, streamline operations, and tap into new markets. Inspire innovation by discovering new insights—without calling the IT department. Make faster decisions with real-time access to massive data sets. Learn from and share insights easily with rich visualizations of real-time data. Who should attend? Business leaders and business analysts focused on marketing, finance, sales, and HR who want to turn Big Data into a business advantage. Join us on Thursday, December 18 at 9:00am Pacific. REGISTER NOW!